OFFENSIVE BACK – Andre Ellington, Clemson, RB, Jr., 5-10, 190, Moncks Corner, S.C. Ellington had a career high 212 rushing yards in 22 attempts to lead Clemson’s 306-yard ground attack in the win at Maryland. Ellington started the day strong with 60 yards rushing in the first quarter. He then iced the game with a 44-yard run for Clemson’s final score of the night. Ellington had five rushes of 10 yards or more, as Clemson scored its highest point total against an ACC team in 12 years. 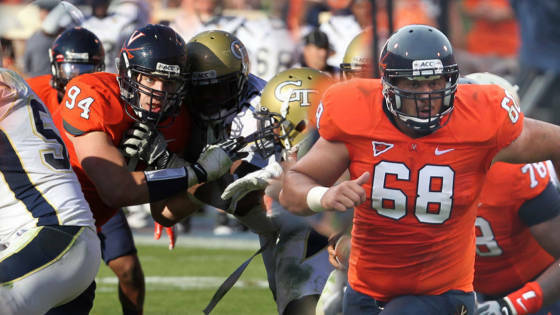 OFFENSIVE LINEMAN – Anthony Mihota, Virginia, C, Sr., 6-4, 285, Fredericksburg, Va. Mihota had the best performance of a stellar effort by the Virginia offensive line in the team's 24-21 upset of No. 12 Georgia Tech. Mihota graded out at 95 percent while playing all 66 plays for the Cavaliers. He had nine knock down blocks during the game. Mihota helped to open the holes that allowed Virginia to rush for 272 yards and roll up 407 yards of total offense against the Yellow Jackets. It was UVa's best rushing total since the 2004 season. With UVa leading 24-21, Mihota and the offensive line helped the Cavaliers run out the clock late in the game (the last 5:58), holding a 10:59 to 4:01 time of possession advantage in the fourth quarter. DEFENSIVE LINEMAN – Matt Conrath, Virginia, DT, Sr., 6-7, 280, Oak Lawn, Ill. Conrath had a career-high nine tackles and blocked a field goal in Virginia's 24-21 upset against 12th-ranked Georgia Tech. He was credited with one tackle for loss. Conrath helped keep the Yellow Jackets' high-powered offense in check, holding Georgia Tech to a season-low 296 yards of total offense and 272 rushing yards. In the fourth quarter, holding a 24-21 lead, UVa held Georgia Tech to seven rushing yards and 10 yards of total offense on two possessions. LINEBACKER – Sean Spence, Miami, LB, Sr., 6-0, 224, Miami, Fla. Senior linebacker Sean Spence led all defensive players with 14 tackles, including a crucial sack late in the fourth quarter for a loss of seven yards. The Miami native finished the game with 1.5 tackles for loss for seven yards. Spence has been the anchor of the defense all season and has amassed 55 total tackles, 8.5 tackles for loss for 33 yards, three sacks for 23 yards and a forced fumble. SPECIALIST – Dustin Hopkins, Florida State, K, Jr., 6-2, 190, Houston, Tx. With four successful PATs against Duke, Hopkins established a new FSU school record, pushing his streak of conversions to 109. It snapped a record held by Derek Schmidt (108, 1984-86) for the past 26 seasons. Hopkins also converted a pair of field goals against the Blue Devils, including a 48-yarder into the wind at the end of the first half, which extended his streak of successful FG attempts to 17. That’s one field goal shy of Graham Gano’s career record 18 consecutive FG’s. Hopkins is one of three kickers in the NCAA’s FBS who has not missed a kick this year, making all 24 PATs and all 10 field goals.